Robotic Limb （ロボット義足） | | Sony Computer Science Laboratories, Inc. 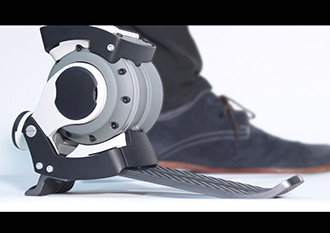 Since 2012, one of Ken Endo's research projects at Sony CSL has been to develop a robotic leg that incorporates a motor in the ankle in order to enable users to walk with a more natural gait. Originally, Endo conducted research on bipedal humanoid robots, but he became interested in prosthetic legs in 2004, when a close friend developed osteosarcoma. Motivated to do research that would benefit his friend, Endo found out about the work of MIT Media Lab Professor Hugh Herr and in 2005, went to MIT and began doing research on robotic limbs. By adding a motor to the ankle of a robotic leg, a more natural walking gait can be reproduced. Sensors detect the force and angle of the ankle joint when a step is taken, and then the motor pushes off the ground to extend and flex the ankle in coordination with the stride, thus artificially replicating the motion found in natural walking. Adding the power boost of the motor makes walking easier than with conventional prosthetic legs. And the robotic leg does not just make walking easier. Since conventional prosthetic legs have immobile ankles, while walking the entire leg must be swung forward from the hip joint, which inevitably creates an unnatural gait. Wearing a robotic leg that reproduces the movement of the ankle solves this problem. 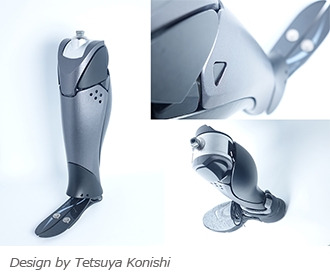 Endo is now developing lightweight, compact robotic legs more suited to the body type of Japanese users. Endo finds motivation in a quote from Professor Herr: "There's no such thing as disability -- only bad technology." He envisions a world in which the line between "able-bodied" and "disabled" is blurred, one in which technology serves not just to compensate for disabilities, but as a means of expanding the inherent potential of human beings. Furthermore, Endo and his team have registered to participate in the very first Cybathlon competition to be held in Zurich on October 8, 2016. Presented by Swiss National Competence Centre of Research in Robotics, Cybathlon is an international competition for people with physical disabilities assisted by the latest robotic technology. Six races will be held, while Endo and his team will participate in the Powered Leg Prosthesis Race. Pilots who have transfemoral amputations or knee exarticulations, are asked to solve as many tasks such as going up and down the stairs or ramps, opening and closing doors, or sitting down/standing up from a sofa, in a given time. 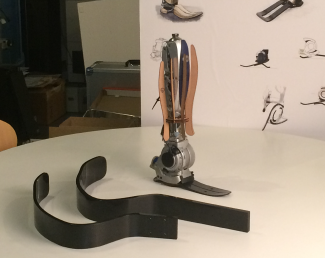 Endo is developing a prosthetics leg with a motor in knee (instead of ankle), for the race.